The surfaces of nano-particles have been functionalized for many different applications including surface modification, drug delivery, biocompatibility, water purification, imaging agents, coating applications, and electronic device fabrication but our exemplary procedures focus on providing a method for dispersion of solid materials in liquid media. 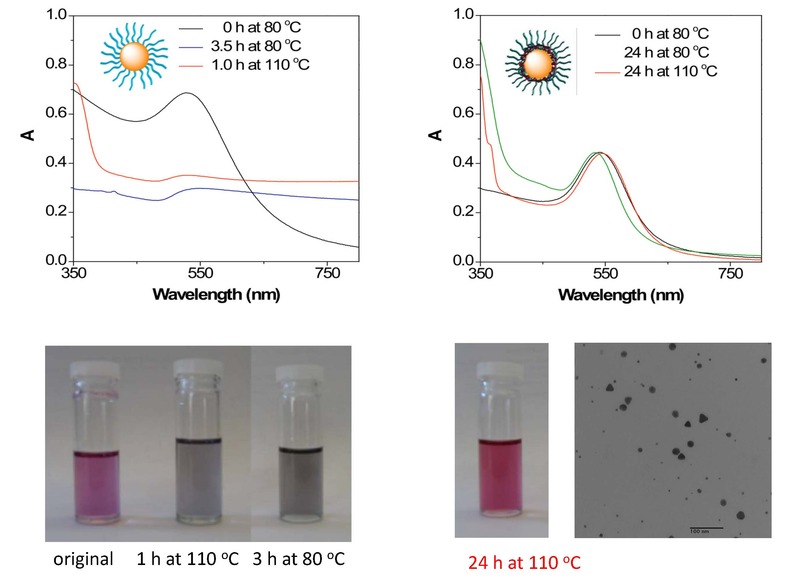 Cadmium sulfide (CdS) quantum dot (QD)-poly(acrylate) nano-composites were prepared using AGET ATRP in a miniemulsion. The QD surface was initially functionalized with a tris(alkyl)phosphine, previously modified with an ATRP chlorine initiator, and subsequently the controlled polymerization was carried out from the functionalized surface of nano-particles. The final material showed high homogeneity and the QDs were evenly dispersed in a suspension medium. The optical-absorption edge in the visible spectra of the nano-composites confirmed the presence of CdS QDs in the suspension. Quantum confinement effects were assigned, though a blue shift in relation to the optical spectrum of the initial QDs. Indeed this example is quite exemplary of the advantages of conducting synthesis of grafted from composite particles in AGET ATRP miniemulsion systems. An efficient synthesis of hybrid organic/silica nanoparticles using silica particles with surface tethered initiators to conduct an AGET ATRP miniemulsion. In comparison to the bulk polymerization, using the same stoichiometry, the use of a miniemulsion polymerization process allowed the preparation of hybrid materials with a higher yield, i.e., higher monomer conversion, and a higher polymerization rate without macroscopic gelation. Direct visualization by AFM provided additional evidence for the formation of well-controlled hybrids. This approach could be applied to the synthesis of various well-defined polymers with complex architectures based on multifunctional initiators including preparation of brush macromolecules. Left hand AFM image of silica/polyBA hybrid nanoparticles prepared by ATRP in a miniemulsion polymerization. Right hand AFM image of brushes formed in a minmemulsion. Another advance in the novel robust technique developed for the synthesis of cadmium sulfide quantum dot-poly(acrylate) nano-composites was the recent development of a one-pot synthesis of thermally stable core/shell gold nanoparticles (Au-NPs) via surface-initiated ATRP of butyl acrylate and a dimethacrylate-based cross-linker. The higher reactivity of the dimethacrylate cross-linker enabled the formation of a thin cross-linked polymer shell around the surface of the Au-NP before the growth of linear polymer chains from the shell. The procedure could be conducted in a one-pot synthesis, simplifying the purification step. There was no inter-particle coupling and no coupling between linear polymer chains. The cross-linked polymer shell served as a robust protective layer, prevented the dissociation of linear polymer brushes from the surfaces of Au-NPs, and provided the Au-NPs excellent thermal stability at elevated temperatures (e.g., 110 0C for 24 h). From reference 4. 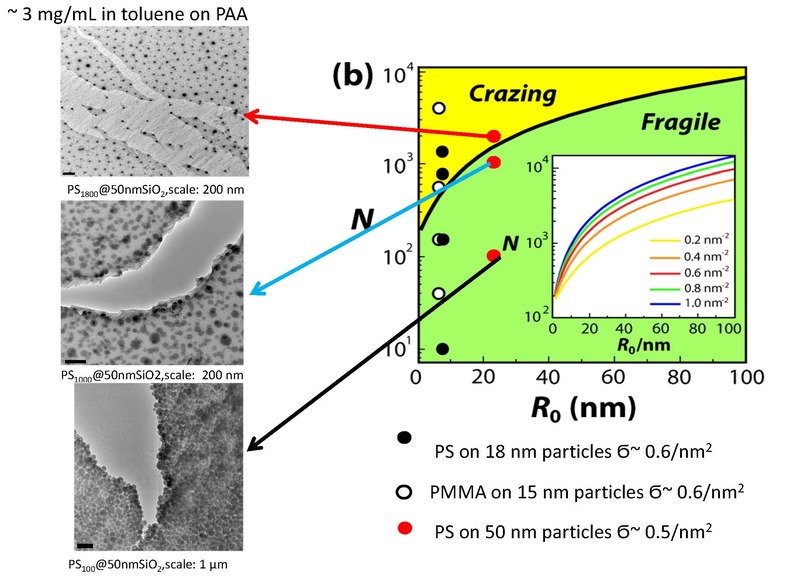 UV-vis spectra (a & b) and appearances (c & d) of Au-NPs modified with linear PBA brushes (Table 1, entry 4) and with a crosslinked shell and tethered PBA brushes (Table 1, entry 3) in toluene at 80 oC and in DMF at 110 oC for varied time. (e) TEM image of the robust core/shell Au-NPs. This synthetic method could be easily expanded for preparation of other types of inorganic/polymer nano-composites with significantly improved stability. Reducing the flammability of polymer matrices remain the subject of continued research efforts. Several hybrid nanocomposites consisting of a magnesium dihydroxide (MDH) core and tethered poly(meth)acrylate chains were synthesized via ATRP to exemplify the synthesis of a fire retardant that can be tailored to the target polymer matrix, in this case for meth(acrylate) matrices. The hydroxyl groups on the surface of the MDH particles were modified by reaction with 2-bromopropionyl or 2-bromoisobutyryl bromide to attach ATRP initiator moieties to the particle. n-Butyl acrylate, methyl methacrylate, dodecyl methacrylate and octadecyl methacrylate were polymerized from the functionalized MDH particles using the “grafting-from” technique. MDH is a representative of flame retardants which release water when heated. Released water can block the flame and exclude oxygen by diluting the presence of flammable gases in the contacting atmosphere. In addition, char formed on the surface of the polymer works as a heat insulating barrier so it interrupts the flow of flammable decomposition products. The polymer chains attached to MDH particles provided the composites with enhanced compatibility in blends with common polymers. The efficiency of attachment, and the molecular weight and polydispersity of the polymers attached to the nanoparticles were investigated by GPC and TGA after post-polymerization cleavage from the particles. AFM was used to analyze morphologies and structure of the composites. The resulting hybrid nanocomposites formed stable suspensions and showed good dispersability in solvents. The dispersability of the fire retardant particles in a selected matrix is illustrated in the following discussion. The dispersability of hybrid particles with matrix selected graft copolymers was examined by studies on the effect of dispersing different concentrations of a SiO2-poly(butyl acrylate) hybrid nanoparticles in a poly(butyl acrylate matrix. The modulus of the poly(butyl acrylate)/hybrid composite structure progressively increased with increasing concentration of the hybrid particle uniformly dispersed in the blended poly(butyl acrylate) matrix. One potential drawback from reinforcing a polymer by addition of a hybrid composite particle is a loss of transparency due to light scattering from the embedded particles – a consequence of the significantly different refractive index, n, of most inorganic materials and the organic embedding medium. A method to suppress the scattering of inorganic nano-particle inclusions within an organic embedding media was recently presented. Suppression of scattering takes place by means of appropriate surface modification of the particle using ATRP so that the effective refractive index of the resulting core-shell particle matches the refractive index of the embedding medium. a: Illustration of a core-shell particle with distinct homogeneous material components comprising the particle core and shell region. b: Illustration of the experimental system comprising a silica nanocrystal (average core diameter approximately 20 nm) and polystyrene (PS) comprising the shell (thickness variable). c: Calculated effective refractive index of the silica-polystyrene core-shell particle as a function of composition. The dotted line represents the refractive index of toluene. The mass ratio m(PS)/m(silica) ~ 0.2 corresponds to a non-scattering configuration. Images of silica nano-particles dispersed in toluene, A bare particles; B grafted particles. The key to the approach is the observation that for core-shell particles with a size less than the wavelength of light the optical properties are approximately equal to those of a homogeneous particle with an effective dielectric constant that depends on the optical properties and volume fractions of the respective constituents. The reference provides a selection of common particle filler materials with appropriate composition of surface-grafted polymer to achieve index-matching and compatibilization, the selected polymer pairs were chosen because of their respective negative Flory–Huggins interaction parameter, for a variety of matrix polymers. An extension of this ability to control the molecular weight of the tethered polystyrene chains, in scalable miniemulsion systems, led to the initial paper on the properties of hybrid particles in solution. The paper provided a quantitative comparison of the effect of the architecture of polymer grafts on the static and dynamic properties of polymer-functionalized colloidal systems in good solvents. Polystyrene-coated silica particles, PS@SiO2, synthesized using atom transfer radical polymerization (ATRP) were selected as an exemplary model hybrid brush system. It should be noted that the particle systems that were the focus of the initial study exhibited a finite size dispersity. 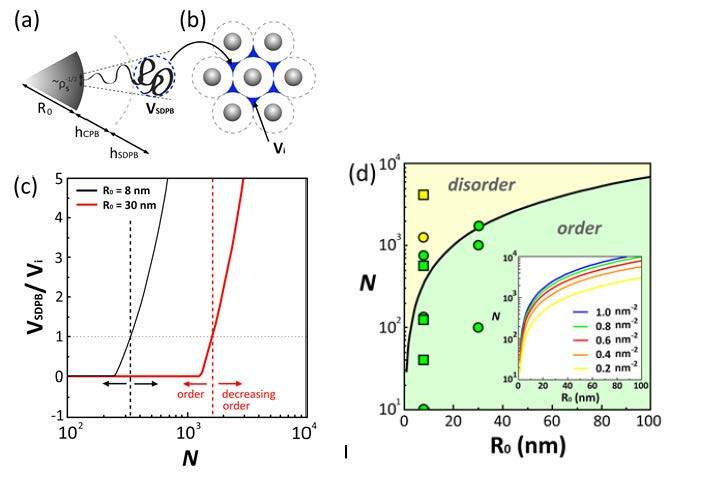 While this introduces more complex trends when compared to ideally uniform particle systems and also reduces the attainable regularity of particle array structures (see images and discussion below), the results should be relevant to a wide range of commercial nanoparticle systems. In the majority of hybrid systems discussed in this section the grafting density of the polymer chains on the particle surface are constant, however it should be stressed that grafting density is an important parameter and will affect the organization of the particles. The first series of hybrid particles consisted of silica core particles with the same core diameter but distinct polymer-shell architecture with increasing degrees of polymerization. The presence of two different brush regimes, whose dimensions are dependent on the graft density and conformation of surface-bound polymer chains: a concentrated brush regime generated close to the particle surface that is characterized by high grafting densities σ, resulting in stretched conformations of the grafted chains and an intermediate brush regime, that is characterized by a reduced grafting density and relaxed polymer conformations. In the case of spherical particle-brushes the effective grafting density decreases with increasing distance r from the particle surface thereby generating a transition from the concentrated to the intermediate brush regime which is expected at a critical distance rDC. Both particle systems conform to a core-shell-like form factor, and single self-diffusion is observed in the limit of dilute concentrations. 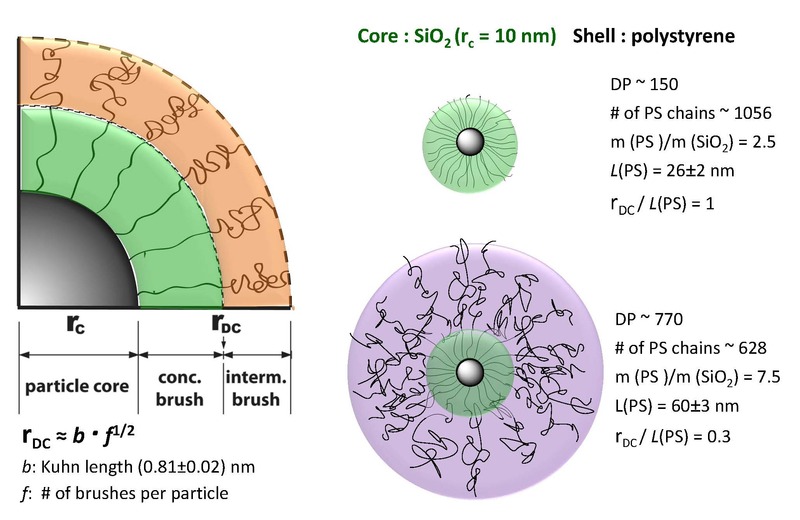 Despite the significantly larger hydrodynamic radius of the intermediate brush particles, the onset of liquid like structure formation is observed at about equal particle concentration for both systems, indicating the “soft” star-polymer type interactions of intermediate brush particles. The comparison with the structure and the hydrodynamic factors of hard-sphere suspensions underlines the occurrence of significant interpenetration of the grafted polymer chains for the particles in the intermediate brush regime. In particular, for semidilute concentrations the threshold concentration for graft polymer interpenetration of dense particle brushes (evidenced by the emergence of a fast cooperative relaxation mode and a slow particle self-diffusion) is found to be increased by about an order of magnitude as compared to the intermediate brush analogue. The above figure shows the normalized diffusion coefficients D(q=0) as a function of the volume fraction ɸ for DP 150 (□) and DP 760 (○) of the tethered polystyrene chains in CCl4 at 20°C. The inset shows in magnification the shaded area in the main plot using the same colors and symbols for the two systems. Solid and dashed lines correspond to Batchelor’s predictions for the self and the collective diffusion respectively. In a first approximation the structural transitions in a particle brush system can be described in terms of a scaling model originally introduced by Daoud and Cotton to describe the structural transitions in star polymers. Following to this scaling approach particle brushes are categorized depending on the polymer grafting density and degree of polymerization of surface-grafted chains into two regimes, i.e., the concentrated particle brush regime (CPB) in which excluded volume interactions give rise to more stretched chain conformations and the semidilute particle brush regime (SDPB) in which chains assume more relaxed conformations. The question then becomes is there a balance between ‘coiled’ and ‘stretched’ brush regimes that determines order formation and deformation characteristics. The pronounced effect of the architecture of grafted polymer shells on the concentration dependence of the osmotic pressure and dynamic characteristics of particle suspensions illustrates the rich and hitherto unexplored parameter space that determines the organization of particles in suspension and provides insight into the origin of subtle effects related to polymer functionalization that have been observed previously in the crystallization of colloidal systems. The different packing environments of polymer chains grafted to the particle’s surface have been shown to give rise to a distinctly different dynamic response above a threshold concentration that provides insight into the effect of polymer grafts on the order formation in particle systems. A question that had to be answered was “is there a balance between ‘coiled’ and ‘stretched’ brush regimes that determines order formation and deformation characteristics”? One in which the M2 << Mentgl system behaved as a “hard sphere’ while, if M2 >> Mentgl, the material behaved polymer –like? Particles with N > NDC can be viewed as core/shell 1/shell 2 particles with shell 1 ↔ stretched brush: h ~ N0.8 shell 2 ↔ random coil: h ~ N0.5. The figure (b) reveals two scaling regimes d ~ N0.8 and d ~ N0.5 that are associated with brush architecture in CPB and SDPB regime regardless of the particle size. The scaling within SDPB regime is found to be equal to the expected scaling for polymer melts thus confirming the proposed relaxed conformation of chain segments within the SDPB regime that is a prerequisite for chain entanglement. This is valid for different particles systems  where the CPB → SDPB transition was observed at Nc ≅ 250, 1280, and 1850 for the particle brush systems with R0 ≅ 7.7 nm, 29.6 nm, and 56.6 nm, respectively. 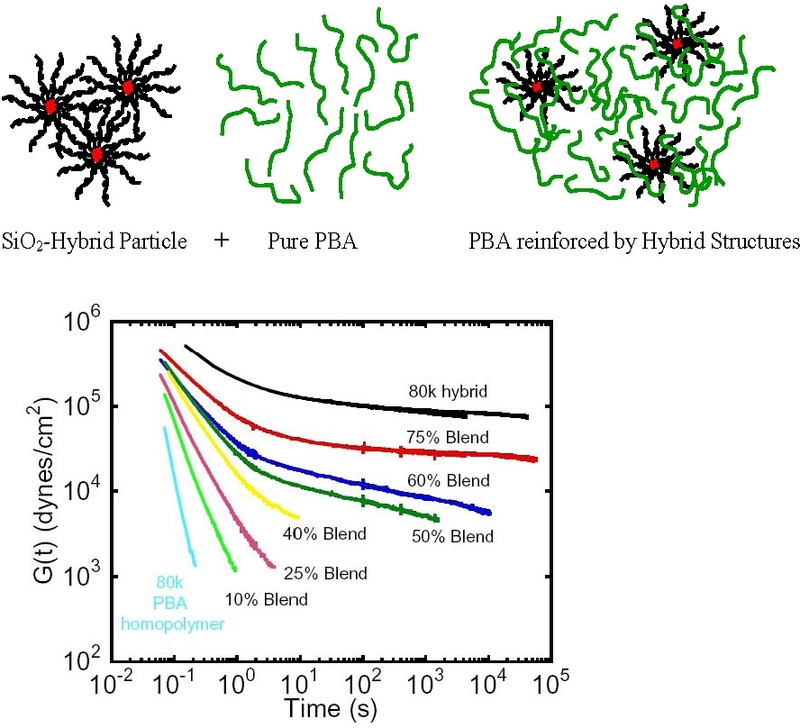 The impact of polymer graft characteristics and evaporation rate on the formation of ordered assemblies of uniform brush systems was evaluated as part of a study on the effect of polymer functionalization on the two-dimensional (2-D) assembly of uniform as well as highly asymmetric binary colloidal mixtures with both neutral and incompatible polymer grafts. 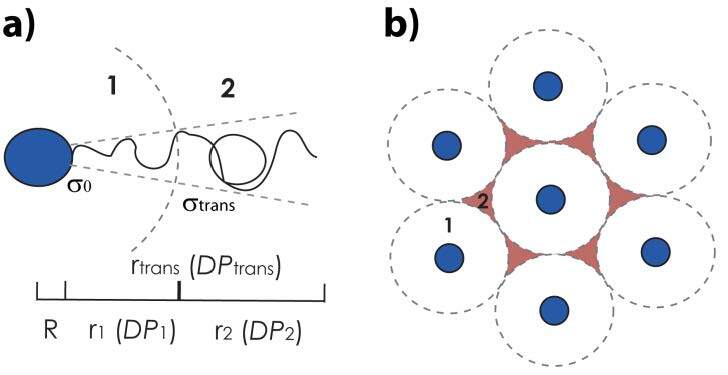 One contributing factor to the formation of well-defined ordered structures of SiO2-S770 hybrid particles is the elastic energy associated with the stretching of the polymer brush to fill the interstitial regions within locally ordered particle arrays. When the study was extended to bulk polymer hybrid systems to study the interactions within nanoparticle lattice structures and overcome the challenge posed by solution based assembly of particle structures to display brittle fracture during solvent evaporation. Transmission electron micrographs of a series of hybrid particles prepared with increasing degrees of polymerization of the tethered polystyrene chains, from DP = 10 to 1360 are shown below. The images show that in the semi-dilute brush limit, the grafting of polymeric ligands facilitated the formation of ordered yet plastic-compliant particle array structures in which chain entanglement give rise to fracture through a polymer-like crazing process that dramatically increases the toughness and flexibility of the particle assembly. The formation of fibrils is observed that “bridge” particle cores across the fracture surface. The image on the left in the following schematic illustrates the proposed mechanism of fibril formation by interparticle entanglement of relaxed chain segments in the SDPB regime. Therefore an evaluation of the effect of a systematic modification polymer grafts on the deformation characteristics of hybrid particle solids was undertaken and it was demonstrated that polymeric ligands (with appropriate degree of polymerization and grafting density) grafted to the particle surface can facilitate the assembly of nanoparticles into mechanically robust yet (short-ranged) ordered solid structures with polymer-like elastic and fracture characteristics. 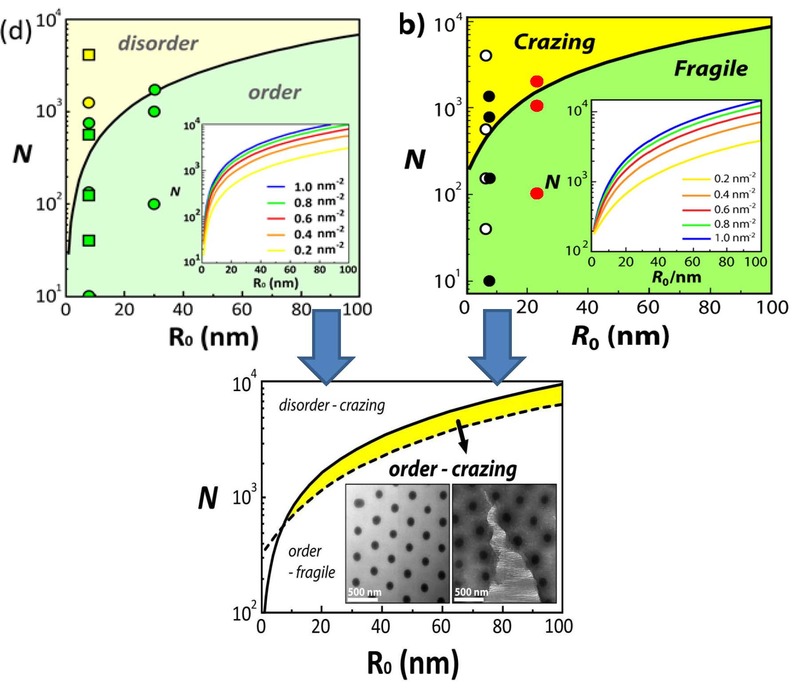 Morphological order increases with DP of polystyrene, also, as the DP increases, more ductile behavior is observed, illustrated by crazing in high molecular weight sample. When polymer chains exceed a critical value and passes from brush to random coil regime, flexible and ordered particle films are formed. A transition from ‘hard-sphere-like’ to ‘polymer-like’ mechanical characteristics of particle solids was observed as the degree of polymerization of grafted chains increased. The elastic modulus of particle solids increases by about 200% and levels off at intermediate molecular weights of surface-grafted chains, a trend that is rationalized as a consequence of the elastic modulus being determined by dispersion interactions between the polymeric grafts. A pronounced increase, of about one order of magnitude, of the fracture toughness of particle solids is observed as the degree of polymerization of grafted chains exceeds a threshold value that is similar for both polystyrene and poly(methyl methacrylate) grafts. There is also a dependence of particle surface-to-surface distance d on the degree of polymerization N of polymer grafts determined by TEM of particle monolayers. The scaling of the chain end-to-end distance RE ~ Nxa of grafted chains is x = 0.81 in the CPB regime and x = 0.52 in the SDPB regime, respectively. The increased resistance to fracture is interpreted as a consequence of the existence of entanglements between surface-grafted chains that give rise to energy dissipation during fracture through microscopic plastic deformation and craze formation. Within the experimental uncertainty the transition to polymer-like deformation characteristics is captured by a mean field scaling model that interprets the structure of the polymer shell of polymer-grafted particles as effective ‘two-phase’ systems consisting of a stretched inner region and a relaxed outer region. The model is applied to predict the minimum degree of polymerization needed to induce polymer-like mechanical characteristics and thus to establish ‘design criteria’ for the synthesis of polymer-modified particles that are capable of forming mechanically robust and formable particle solid structures. wherein c is the total length of the cracks; Pmax is the maximum load, Xv is an empirical constant = 0.015, t is the distance from the center of the indentor to the corner, l is the length of the cracks that emanate from the corners, E is elastic modulus and H is hardness. Interestingly, the toughness of particle brush solids in the SDPB regime is found to significantly exceed the toughness that would be expected for the corresponding homopolymers with equal molecular weight as the surface-grafted chains. This is illustrated in the inset in the figure above that compares the measured toughness of PS-grafted particle brushes with literature values for PS homopolymers. While both PS homopolymer systems that were evaluated in the present study confirm the reported trend of KIc(M) the toughness of SiO2-S770 is found to exceed the expected toughness by almost one order of magnitude. We rationalize the increased toughness of particle brush solids as a consequence of the connectivity of grafted chains with the particle center that imposes (topological) constraints on the deformation of the entanglement network that gives rise to energy dissipation during fracture through microscopic plastic deformation and craze formation. Another factor of interest in the properties of self-assembled hybrid particles is the degree of order of the silica core particles in the final film is the transition from a disordered to an ordered distribution, as observed when one examines the distribution of the particles in the earlier images of SiO2-S10 and SiO2-S770. The close packed regular structure can no longer be maintained and the particles become increasingly disordered as one transitions from CPB, which forms an ordered hexagonal particle array due to the presence of hard-sphere type interactions, to SDPB, in which relaxed chain segments of the tethered chains can fill the interstitial space in the particle latex structure and thereafter as the volume of the chain exceeds the available void space. Continuing this argument, the critical degree of polymerization that results in a decrease of structural regularity of solid particle arrays can be estimated by determining the conditions that the volume fraction of segments in the SDPB regime exceeds the available void space, i.e. where a close-packed arrangement of monodisperse particles has been assumed and C is a constant (of the order unity) that accounts for the number of particles per unit cell volume. Evaluation of this condition as a function of particle core size, grafting density, and degree of polymerization of surface-grafted chains allows the construction of a “structure map” for the expected order formation characteristics of particle brush systems as illustrated in the right hand figure above where the curves are expected to approximately delineate the transition from ordered to disordered arrangement. Green and yellow symbols denote increasing and decreasing order parameter with increasing degree of polymerization of surface-grafted chains for the respective particle system (squares: 8SiO2-S-N and 8SiO2-MMA-N; circles: 30SiO2-S-N; and triangles: 60SiO2-S-N). Is this a sharp transition? Perhaps an idea of what can occur is seen one superimposes the “order-disorder” and the “fragile-crazing” plots: one obtains an interesting result. There is appears to be a certain area of composition, a window, where a film of a self assembled particle/polymer brushes can display both ordered particle dispribution and polymer like crazing. The predicted dependence of the threshold degree of polymerization for ‘ordered yet tough’ particle array structures depend on the particle core size (R0) and N in order to facilitate entanglement formation of grafted chains on the particle core as well as periodic arrangement of the particle brush systems. Insets show TEM of SiO2-S2000 monolayers depicting hexagonal arrangement and craze formation. Solid and dotted lines represent order-disorder and fragile-crazing transition, respectively. A potential application for homo-arm stars was illustrated by preparation of two well defined star macromolecules with two oppositely charged arm structures; a poly[2-(dimethylamino)ethyl methacrylate] (PDMAEMA) star and a poly(acrylic acid) (PAA) star with cross-linked cores. (6) It is possible to exploit the electrostatic interactions between the polyelectrolyte arms of PDMAEMA star and PAA star polymers to generate all-star polyelectrolyte LbL films with alternating multilayer thin films using layer-by-layer (LbL) assembly. The star/star multilayer films possess non-uniform and nanoporous structures, which result from the characteristic architecture of star polymers. The thickness, porosity, and refractive index of star/star multilayer films are precisely tunable by assembly pH conditions. Furthermore, as-assembled star/star multilayer films exhibit distinct morphological changes by undergoing extensive structural reorganization upon post-treatment under different pH conditions that do not lead to any changes with their linear compositional counterparts; it is hypothesized that these differences are due to the star polyelectrolyte's compact structure and decreased extent of entanglement and interpenetration, which lead to a low degree of ionic crosslinking compared to their linear counterparts. We have observed an enhanced ionic (proton) condution of star/star multilayers following the pH-induced structural reorganization. 1. Siegwart, D.J., et al., Cellular Uptake of Functional Nanogels Prepared by Inverse Miniemulsion ATRP with Encapsulated Proteins, Carbohydrates, and Gold Nanoparticles. Biomacromolecules, 2009. 10(8): p. 2300-2309. 2. Dong, H., et al., Recyclable Antibacterial Magnetic Nanoparticles Grafted with Quaternized Poly(2-(dimethylamino)ethyl methacrylate) Brushes. Biomacromolecules, 2011. 12(4): p. 1305-1311. 3. Esteves, A.C.C., et al., Polymer grafting from CdS quantum dots via AGET ATRP in miniemulsion. Small, 2007. 3(7): p. 1230-1236. 4. Li, Q., et al., Air-tolerantly surface-initiated AGET ATRP mediated by iron catalyst from silica nanoparticles. J. Polym. Sci., Part A Polym. Chem., 2010. 48(9): p. 2006-2015. 5. 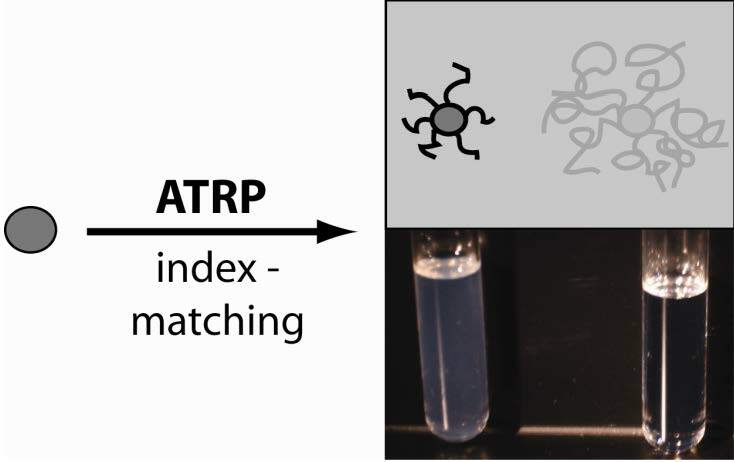 Bombalski, L., et al., Preparation of Well-Defined Hybrid Materials by ATRP in Miniemulsion. Macromolecules, 2007. 40(21): p. 7429-7432. 6. Dong, H., et al., One-Pot Synthesis of Robust Core/Shell Gold Nanoparticles. J. Am. Chem. Soc., 2008. 130(39): p. 12852-12853. 7. Ok, J. and K. Matyjaszewski, Synthesis of Magnesium Dihydroxide Hybrid Nanocomposites via ATRP. Journal of Inorganic and Organometallic Polymers and Materials, 2006. 16(2): p. 129-137. 8. Bombalski, L., et al., Null-scattering hybrid particles using controlled radical polymerization. Advanced Materials, 2007. 19(24): p. 4486-4490. 9. Voudouris, P., et al., Effect of Shell Architecture on the Static and Dynamic Properties of Polymer-Coated Particles in Solution. Macromolecules, 2009. 42(7): p. 2721-2728. 10. Batchelor, G.K., Brownian diffusion of particles with hydrodynamic interaction. J. Fluid Mech., 1976. 74, Pt. 1: p. 1-29. 11. Daoud, M. and J.P. Cotton, Star-shaped polymers: a model for the conformation and its concentration dependence. J. Phys. (Les Ulis, Fr. ), 1982. 43(3): p. 531-8. 12. Choi, J., et al., Effect of Polymer-Graft Modification on the Order Formation in Particle Assembly Structures. Langmuir, 2013. 29(21): p. 6452-6459. 13. Ojha, S., et al., Impact of polymer graft characteristics and evaporation rate on the formation of 2-D nanoparticle assemblies. Langmuir, 2010. 26(16): p. 13210-5. 14. Choi, J., et al., Flexible Particle Array Structures by Controlling Polymer Graft Architecture. J. Am. Chem. Soc., 2010. 132(36): p. 12537-12539. 15. 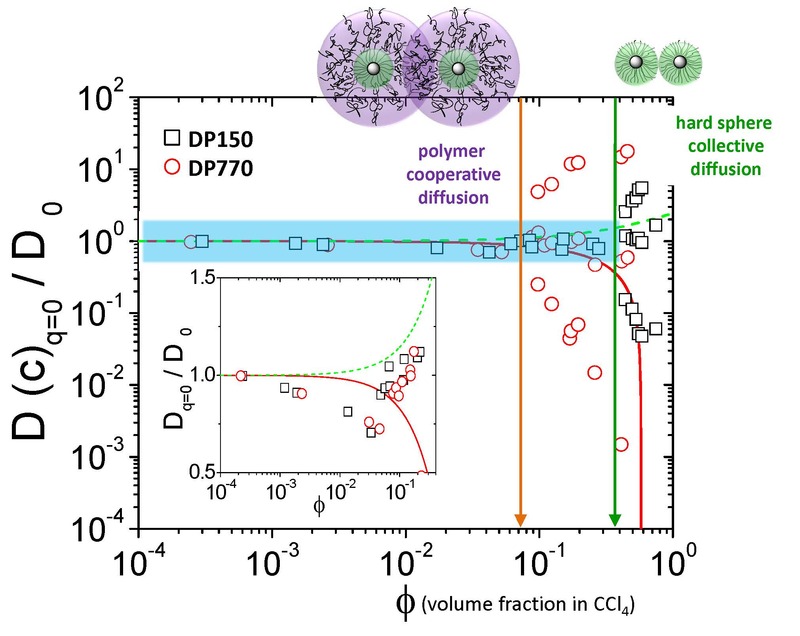 Choi, J., et al., Toughening fragile matter: mechanical properties of particle solids assembled from polymer-grafted hybrid particles synthesized by ATRP. Soft Matter, 2012. 8(15): p. 4072-4082. 16. Voudouris, P., et al., Anisotropic Elasticity of Quasi-One-Component Polymer Nanocomposites. ACS Nano, 2011. 5(7): p. 5746-5754. 17. Kim, B.-S., et al., All-Star Polymer Multilayers as pH-Responsive Nanofilms. Macromolecules, 2009. 42(1): p. 368-375.